I’d have to go for Wire’s “Red Barked Tree” – fresh, powerful, inventive as usual and top tunes too! I am with you on Brill Nudie and Honey Lanes Bye Bye….Were melting.I listened to a couple of tracks via their awesome website and i was hooked.Now the proud owner of a fantastic value for money pure artistic cd collectors item and lyrical/musical genious. @Steve I’ve not heard “Red Barked Tree”, but I really must. 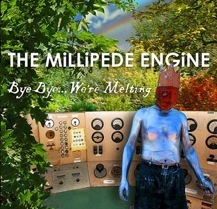 By coincidence, according to the blurb on their website, the guys in The Millipede Engine met partly as a result of Wire’s “154”. @Tony Yeah, with all the bits and pieces that come with it, you’re right about the “Bye Bye” CD being quite a collector’s item.